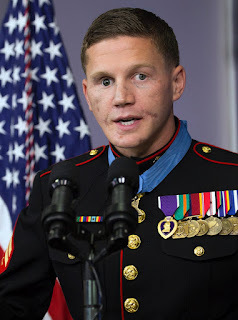 The story goes William "Kyle" Carpenter was a dead man. It's true. Carpenter was declared "dead" by the officials at an Afghan field hospital and at Walter Reed Army Medical Center. Although he was revived by the medical teams, he should have breathed his last because of the wounds he sustained on November 21, 2010. It was on that day that Carpenter and another Marine were stationed on the roof of a building during a firefight with the Taliban in Afghanistan's Helmand Province. Manning his machine gun, Carpenter saw an enemy hand grenade land near their position. Rather than running away from the grenade, Carpenter ran toward it and used his body to shield his comrade. The blast collapsed one of his lungs, destroyed his jaw, cost him an eye, and shattered his body in a horrible manner. His injuries kept him in the hospital for almost two-and-a-half years. Still, it should be noted this once-dead man is now leading a most exceptional life. Carpenter says, "The enemy killed me. I came back, ran a marathon, completed a mud run, and jumped from a plane." He didn't mention the fact he has also thrown out the opening pitch at a Padres baseball game, and he has also stopped by the White House where the president has bestowed on him the Medal of Honor, the highest military award America can bestow. His story reminds us of our Savior who sacrificed Himself so that those who believe on Him would be forgiven and saved. Rather than running from death and saving Himself, Jesus dedicated Himself to the cause of offering His life so we might live. Now, because of the risen Redeemer's gracious and selfless sacrifice, believers are freed from sin's condemnation and are given new lives -- lives that are filled with blessing and hope. Looking past His resurrection, Jesus shared the purpose of His work when He said "I came that they may have life and have it abundantly." Dear Lord, we thank You that we can live an abundant life because of what You did for each of us. Help us share that good news today. In the Name of Jesus, Amen.